Is it any wonder Southerners are partial to sweet potatoes? The warm, moist climate and sandy soil the South provides are perfect growing conditions for sweet potatoes. In most parts of the US, sweet potatoes make an annual appearance on the Thanksgiving table, but Southerners use them year-round in everything from soups, casseroles, and pies to biscuits and bread. North Carolina is the sweet potato capital of the world, with Louisiana, Mississippi, and California following closely behind. Each October, North Carolina and Louisiana pay homage to the sweet potato – with North Carolina’s Sweet Potato Festival and Louisiana’s Yambilee Festival. Because of their many health benefits, sweet potatoes are often referred to as nature’s health food. They are loaded with Vitamin C and beta-carotene – two powerful antioxidants that work to eliminate free radicals (which damage cells) in the body. High in fiber, fat and cholesterol-free, sweet potatoes are simply one of the most nutritious vegetables around! American Indians, whose name for sweet potatoes is batatas, were growing them in their gardens (in Louisiana) as far back as the 1500’s. They originated in Mexico, Central, and South America, as well as the West Indies. Of the many foods Christopher Columbus brought back to Spain after his first voyage to the West Indies, sweet potatoes were his most prized possession. From there, Spain began to cultivate them and Portuguese explorers brought them to Africa, India, and southern Asia, where sweet potatoes continue to be a main dietary staple. 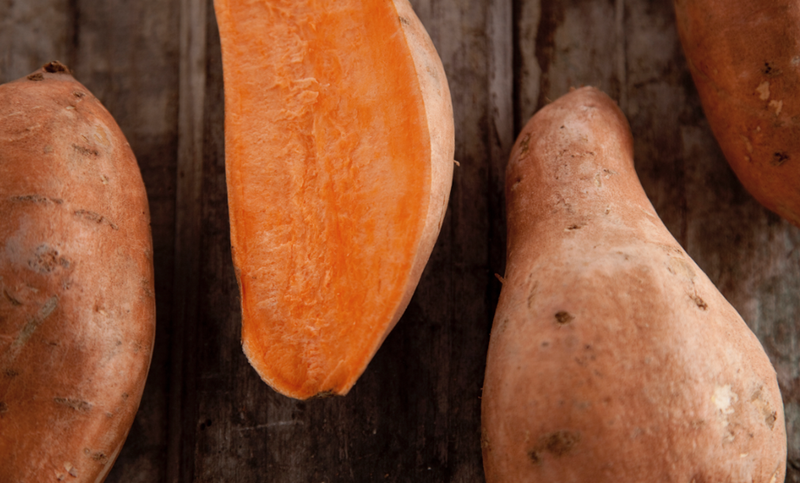 One common misconception is that sweet potatoes and yams are one in the same. Actually, they are not related at all! Sweet Potatoes are the root of a vine in the morning glory family and yams belong to the lily family. Yams are native to Africa. They are starchy and not very sweet and can grow very large – with some weighing up to 100 pounds! The African words nyami, and njam, which means “to eat” is what probably brought the two vegetables together. Select firm, fairly evenly shaped sweet potatoes with even skin coloration. Choose sweet potatoes with a deep orange color for the best nutrition value. Avoid Sweet Potatoes with any soft brown spots, as these are signs of decay. Do not store sweet potatoes in the refrigerator as the cold temperature negatively alters their flavor. Instead, store sweet potatoes in a cool, dry container. For the best flavor and freshness, use your Sweet Potatoes within a week or two after buying them. Covington: This popular supermarket variety has a heavy, larger-than-average size. It has rose-colored skin and a succulent orange flesh. Evangeline: Evangeline is prized for its beautiful rosy skin and almost burnt orange flesh that is sweet and juicy. The size is smaller than others. This variety contains an abundance of sucrose, so it’s a good choice for baking and microwaving. Puerto Rican: Puerto Rican has a smooth, light texture and rich sweet potato flavor. The skin is copper-colored and the flesh is red-orange. The Puerto Rican’s size, about 4 inches long, is about average for a sweet potato. Sweet potatoes are a part of our Thanksgiving tradition, but now that you know how nutritious they are, be sure to add them to your meals throughout the year! So from our kitchen to yours, Paula shares some of her best sweet potato dishes for you to enjoy.